JSC “Voltyre-Prom” is specialised on producing tyres for agricultural machines and vans. The company belongs to a leading tyre manufacturer JSC „Cordiant” and it is one of five of its branches producing more than 400 different types of tyres for very different vehicles. The company has several quality certificates and it markets tyres of good quality in almost 150 regions all over the world covering almost all the sectors of economy. 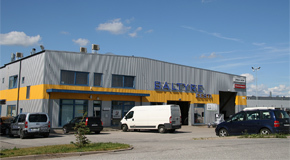 Voltyre tyre importer and seller of Estonia is Baltyre Eesti AS.